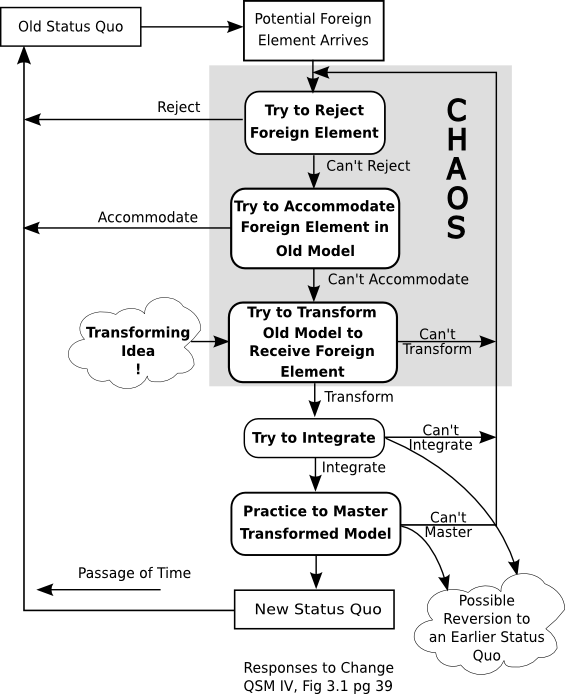 In Understanding Change I described the Satir Change Model. Near the bottom I acknowledged that I described a “happy path” change. Many designed changes never change anything. Other change initiatives look promising for a while, but as time passes people revert to working “the way we’ve always worked around here.” In the “move to team room” scenario these would be the team never moving into the team room, and the team moving to the team room, but slowly reverting to staying in their cubes. What happens in these situations? Actually, many paths exist between starting a change, and ending back in the old status quo. How many paths can you find in this figure that lead back to the old status quo? Now you see what traps change initiatives and takes them off track, usually back to the old status quo. If your change initiative has started its path back to the old status quo, contact me and let’s work together on helping the change succeed.